Meet the most comprehensive Magento 2 theme which can be one-stop solution for you. 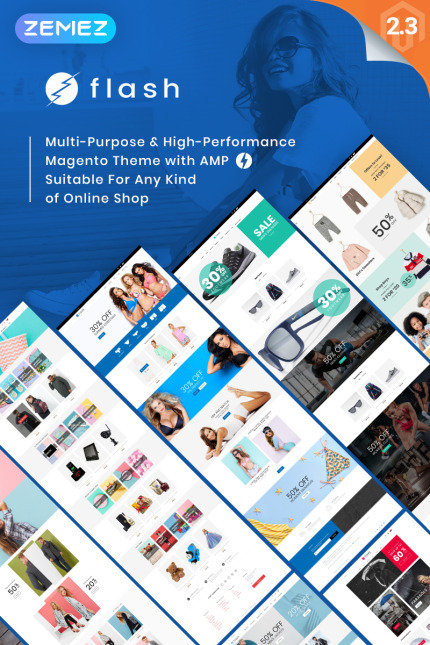 Flash is the ideal choice to launch a completely responsive online store, due its multipurpose nature the theme can be easily adapted to any e-commerce niche, whether you are selling jeans or home appliances. Flash features 3 Home Pages, 4 Header and 4 Footer layouts that can be enhanced with any type of custom content, such as clickable banners, edge-to-edge sliders, featured products blocks with tabs structure, list of blog posts or store brands with no need of extra extensions. With Flash theme you will get your store mobile content to load in 2-3 seconds. Go above and beyond and make your online store amazing!